A demonstration against Rodrigo Duterte, who will be making the first visit to Israel by a president of the Philippines, will be held tomorrow, Tuesday September 4, at 9:30 am, at Hanassi Street 3 in Jerusalem, the official presidential residence. The protest will be held during Duterte’s meeting with the Israeli President Reuven Rivlin. Duterte wants to improve “security cooperation” with Israel, which has sold the Philippines three radar systems and 100 armored vehicles. Manila is now looking to sign an aircraft deal with Israel. On Tuesday, the demonstrators in Jerusalem will be protesting against military ties between the two countries as well as the murder by security Philippine forces of thousands of citizens. 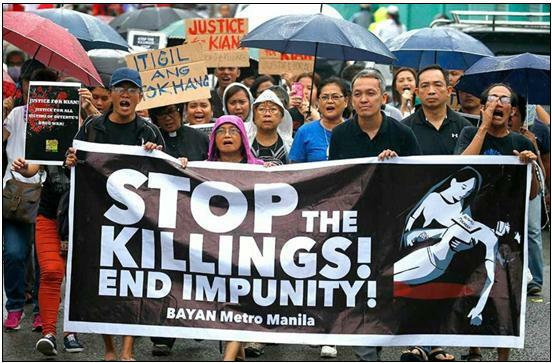 Duterte is currently facing two complaints before the International Crime Court (ICC) – a mass murder complaint filed by attorney Jude Sabio that is under preliminary examination and another by families of “drug war” victims. In March, Duterte ordered the withdrawal of the Philippines from the ICC. Mack sent his appeal to Rivlin’s office on behalf of at least 24 other well-known human rights and leftist activists (among them, Communist Party of Israel activists), arguing that welcoming Duterte is a tacit endorsement, empowering leaders like him across the globe. “There is no doubt that when the international community stands idly as a leader calls for massacres, and in fact commits massacres against specific population groups, it legitimizes other murderous leaders,” Mack wrote in his appeal. The strongman leader will be in Israel for a four-day visit, which will include a lunch meeting with far-right Prime Minister Benjamin Netanyahu and a visit to the Yad Vashem Holocaust museum. Before returning home, Duterte will also dedicate a new memorial to the victims of the World War II genocide in Rishon Lezion, south of Tel Aviv. In 2016, in a bungled reference to an opponent’s remark that his rise to power might be like that of Adolf Hitler, Duterte said that he himself would be “happy to slaughter” millions of drug addicts on the scale of the Nazi leader’s Jewish genocide. Yet Israel’s Government Press Office has said most of the visit will be closed to the media, an apparent precaution against faux pas by a president whose two-fisted crime-fighting tactics and fascist rhetoric have raised hackles at home and abroad.